The best thing I’ve made in the kitchen lately is a Pavlova. A few years ago, a co-worker brought one to a holiday potluck. I’ve been thinking about trying it myself since then but was worried my oven would be too flakey to pull off such a delicate dessert. All such concerns were unwarranted. It turns out that low and slow is my oven’s speciality. All the cracking and deflation as it cools add to the Pavlova’s charms. In the end, it all gets filled in with whipped cream and fruit. We pause here to lick our lips in remembrance. If I were to change anything next time, I wouldn’t sweeten the whipped cream as the meringue is itself such a sugar bomb. Oh yes, there will be a next time. 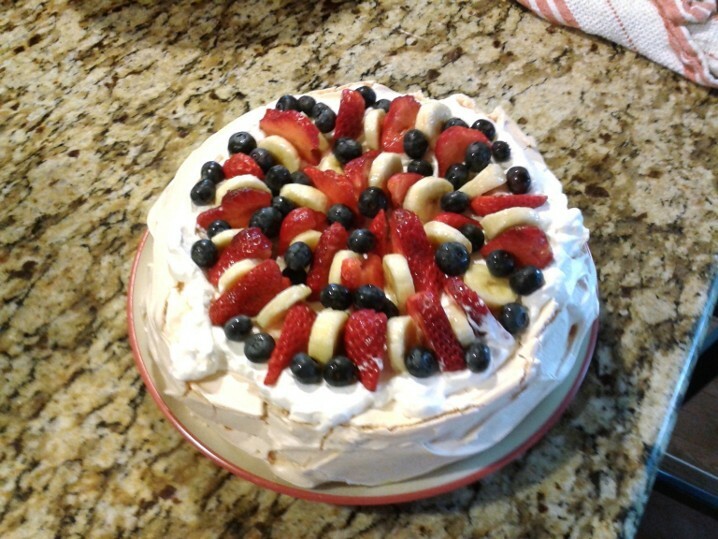 This entry was posted in Kitchen Chemistry and tagged dessert, fruit, meringue, whipped cream on February 19, 2013 by Angerie.